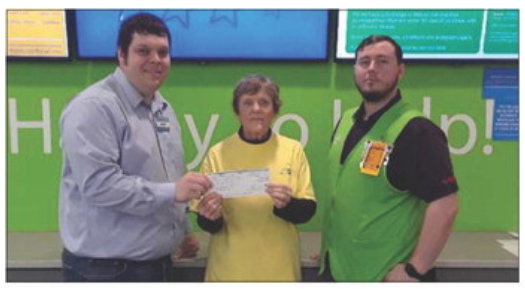 Riley Weatherford, Personnel Mgr (left) and James Rambo, Store Mgr (right) of the Walmart Neighborhood Market, present a $1000 check from the Walmart Community Grant Program to Sue Moore, President of the Companion Animal Assistance Program. These funds will help the local non-profit group provide spay/neuter assistance to lower income families and student pet owners in the Stillwater area. CAAP also works with Stillwater Animal Welfare to make sure all dogs and cats are spayed and neutered before they are adopted from the city facility.